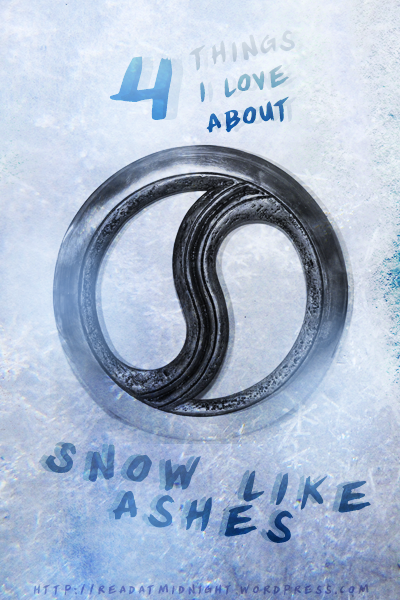 Snow Like Ashes to the second YA fantasy I’m reviewing this week that’s likened to Game of Thrones. I don’t agree, I think it’s more similar to The Lumatere Chronicles by Melina Marchetta, which is another of my favourites. Snow Like Ashes also manages to be unique with characters that I can root for, I LOVED it. Here’s a few reasons why. There are 8 kingdoms in this world. Four are Seasons: with close links to magic that grants them only one season a year, thus they are named for these seasons. Hot, dry Summer that are uninviting to our protagonist. Cool, vibrant autumn with citizens of copper skin. Spring, though lovely in name, is ruled by a dictator named Angra with powerful magic. Finally, Winter, the lost kingdom of eternal snow – utterly destroyed by Angra 16 years before the start of this novel. Furthermore, there’s four Rhythm kingdoms that undergoes the normal seasonal cycle. We mainly got to see Cordella, a prosperous kingdom who’s chief exports are lavenders and princes that steals your heart. All of these settings are described in beautiful clarity and reading about them was akin to a cinematic experience. There’s also an interesting magic system here, where only the reigning monarch of each kingdom has access to magic via a conduit. Does having the kingdom’s safety resting on a locket or a staff sound dangerous to you? That’s because it is! Basically how Winter fell. However, there are hints there’s more to magic than these conduits, something I’m interested to see in the future books. I reach out and touch the spines of the books on the shelf. They remind me of the fire pit Finn brought back. Holding on to some part of your past even if it means also holding on to the pain of never again having it. That pain is less horrible than the pain of forgetting. I will confess I got quite weepy over this book, perhaps it’s because I was nursing a flu while reading it, or perhaps it’s because I identified with how Meira felt. Told that she should love and serve a kingdom she’s never even seen since birth, I think both Meira and Mather felt lost. I could feel all the Winterian’s yearning: to reclaim their home, to find a place to belong, to have something to be proud about. I felt for them when they witnessed the Cordellans and the pride they had in their own country. There’s also a scene with the Winterians towards the end of the book that left me a quivering mess, I don’t want to spoil too much, so just read it guys! I adored Meira who did not have the answer to everything, nor the strength to accomplish all the great heroic feats, but still persevered regardless for her fellow survivors. She had a complex relationship with Sir, her pseudo-father figure and mentor that wrenches at my heart. The way she she fought for his approval while trying to maintain her own identity was something I could empathise with. Meira’s struggle to identify with Winter and longing for it was also beautifully portrayed. Though she has never seen it for herself, her memories comes from the tales of the older generations and she still yearns for this home. As mentioned in the previous point, I thought this was something the novel illustrated with finesse. I also really enjoyed that while there was a small undercurrent of romance (and even a dreaded love triangle) in the book, it was Meira’s journey that was the most important. Never did she veer away from her main task of rebuilding Winter, no matter how many boyfriends the plot threw at her, this is something I appreciated a lot. FACT: I didn’t get the concept of book boyfriends until I met Theron. He’s so unconventionally charming, understanding, and a perfect partner and equal for our heroine. I love how he connects to Meira on an instinctual level, as they both understand what it’s like to be denied your true calling and a chance to prove self-worth. I also love that they develop as individuals by meeting one another, this is an essential element for me in any romance and I look forward to seeing more of these two in the next books. I also liked that Theron had an ambition and personal struggles of his own outside of Meira, as so often these love interests are left underdeveloped. I liked Mather and his complex relationship with Meira as well, they had so much baggage from the status inequality – but have loved each others through the years despite it. Though I’m firmly a Theron fan, I’m also excited to see more of these two in the following book. Basically, I love this book and it’s my favourite YA fantasy read in a long time, this book has it all: engrossing storyline, a protagonist you can respect and root for, beautiful worldbuilding, a heartwrenching large scale war that’s affected an entire race of people, plus two complex love interest. It got me in the feels, guys. I agree with everything you say! This was one of my most anticipated releases for 2014 and I’m so glad you loved it! Can’t wait for Ice Like Fire!!! I need Ice Like Fire like burning haha, but I’m glad that this book largely resolved most of the issues and didn’t end on the cliffhanger. I’ve been hearing so many things about Snow Like Ashes recently! I really need to pick it up now. You’ve made me fall in love with Theron without even reading the book. I can’t wait to read this. Not only does it have a stunning cover, but it sounds amazing. Thanks for sharing. Thanks for stopping by Sue! I hope you will enjoy the book when you get a chance to read it. I’m really loving your reviews! 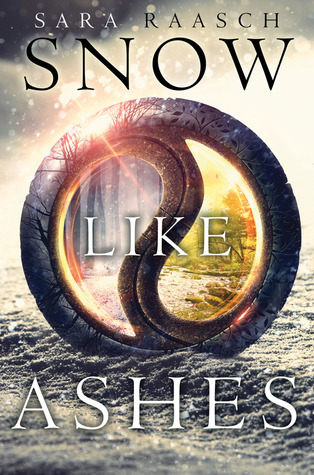 Snow Like Ashes was a winner for me – not too heavy on the fantasy, but still imaginative. The setting was definitely a plus for me, as was the struggle for identity that many of our characters encountered. Thank you, I’m glad you like my reviews 😀 I agree that the magical element wasn’t too much of a focus, so it’s more accessible for people who don’t like fantasy as well. Snow Like Ashes was so perfect in every way for me, can’t wait to read Ice Like Fire! Great to hear 🙂 I hope you will enjoy it!! I’m so glad you loved this! I honestly couldn’t wait to read this! I’ve been hearing lots of great things about it! Lovely review! I really need to read this book, especially before Ice Like Fire comes out! Loved this one as well and it is one of my favourite High Fantasy novels that I have read this year! It was just beautifully crafted and Meira is such a strong heroine! And Theron …. ❤ Can't wait for the sequel! Me too, the world was so vivid and beautiful. I heard there’s loads of Theron goodness in the sequel, can’t wait! !